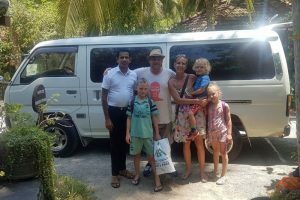 Sri Lanka Car and Driver Hire/Forums/All Forums/General Questions/What type of driver should I go for. We are a large family planning to spend 3 weeks in Sri Lanka in 3 different locations. Once at each location we won’t be travelling much distance everyday. What is the most cost effective way of hiring a driver if we won’t be doing a lot of distance everyday? The best option for you is probably to hire three separate drivers at each place you stay, and again for the occasional day trip. Also you may not need a qualified guide depending on what you are planning to visit, a regular taxi driver may be sufficient for your needs. To give you the best advice we would need to know your plans in more detail. Feel free to post more information if you require any further advice. Thank you for your feedback. We would need a driver to take us from Colombo to Trincomolee on the day we arrive possibly breaking up the journey with a visit to a buddhist temple. We stay at Trincomolee for 7 nights planning to go whale watching and possibly visit a near by elephant gathering. Then we travel to Weerawila for 5 nights where we will probably visit one of the national parks and bird sanctuary. We then travel to hikkaduwa for 6 nights. We would probably do a couple of days out and then to Negombo for 2 nights. Then Colombo airport. There will be a number of days when we will be staying local and not need a driver. In that case you will probably not want a driver for the full duration of your trip. The best option would be to find a driver for your three main transfers and then use local buses or tuk tuks for day trips. The main difference in cost is having to find accommodation for your driver for 20 days. Of course, if your accommodation offers this for free then it may be a better option to keep the same driver. It also depends on how much hassle you want day to day with local tuk tuk drivers who are very capable of ruining a well planned trip. If money is no object then you could spend more for the peace of mind of having a driver available when you need them.